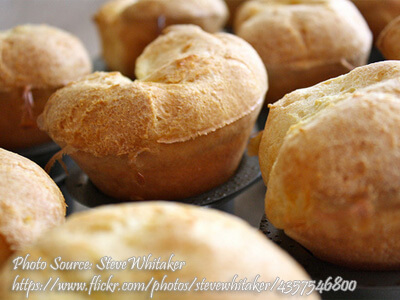 Popovers are hollow roll made from an egg batter which is light and crusty. Typically they are baked in muffin tins with almost vertical straight wall sides rather than angled compared to cupcakes. Maybe the reason why it is called popovers is because the top of this bread is popping out from the baking tins. Popovers are suited in any occasions since it is very simple to make and consists only of very few ingredients. Mix all dry ingredients well. Beat eggs with electric mixer or rotary egg beater. Add beaten eggs to milk, then add dry ingredients. Beat until smooth (about 1 minute). Fill hot oiled muffin pans half full. Bake at 475 °F for first 15 minutes then at 350 °F for last 25 or 30 minutes. After baking, prick each popover to allow steam to escape. Turn off heat and leave popovers in oven 15 to 20 minutes if dry interior is desired.